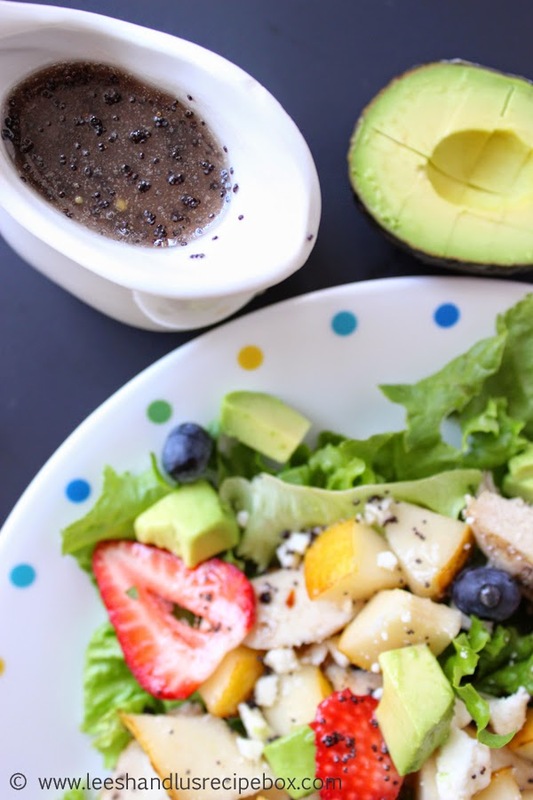 I feel kind of bad not sharing this dressing recipe with you sooner. We've been enjoying it for the last 7 years. I need to share my staples more I guess. I hope you'll forgive me! On Saturday my sweet husband grilled a few pounds of chicken for us so we could have more yummy salads for lunch. I'm really trying to stop eating quesadillas with my cheese loving children every day for lunch - and after day one of having this salad, I think I could do this for life! 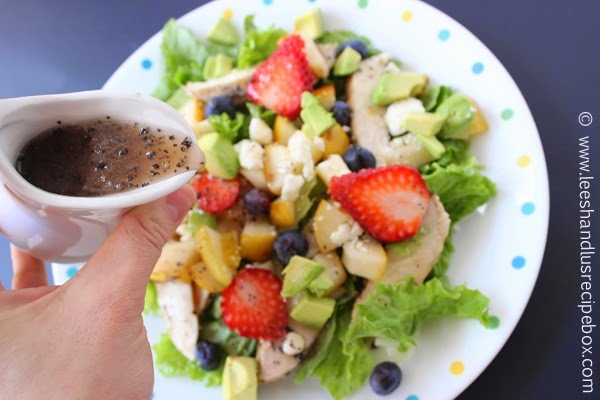 I don't always make the same salad - but this one was some fresh greens, grilled chicken, my favorite fruits (blueberries, strawberries, and pears), some tangy feta, and some buttery smooth avocado topped with this lightly sweet dressing is like heaven. A few other things I love on a salad are grated carrots, toasted almonds or pecans (candied if you prefer), bleu cheese, cucumbers, sweet corn, black beans, cilantro. You can really change it up. I feel like this salad dressing is versatile enough that you can use it on most any kind of green salad. Blend or shake all the ingredients in a blender or pint jar. Just don’t blend the poppyseeds. Shake those in. Store in the fridge. If it solidifies from the olive oil let it sit at room temperature for 30-60 minutes to let it melt. Mine doesn’t always solidify. What a gorgeous salad! 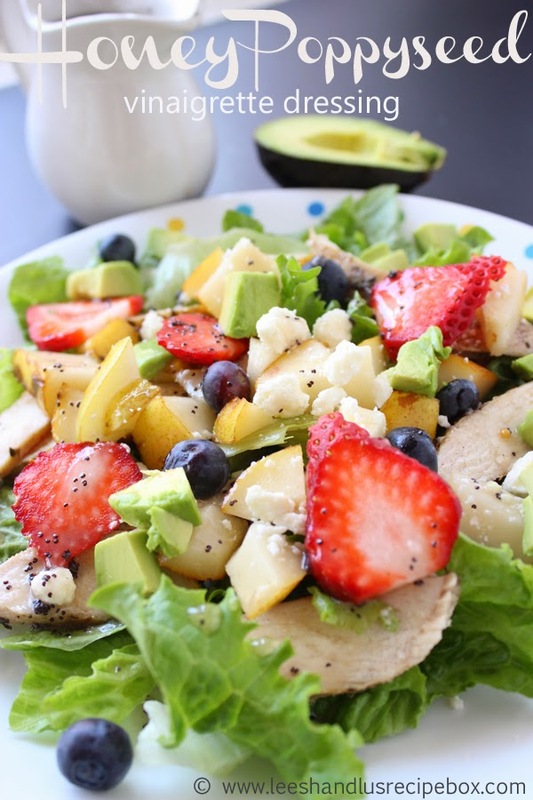 The dressing sounds SO good and flavorful! Thank you! I hope you will like it too! By the way, you were too generous to share this lunch with me last week. It was, no question, the best salad I've ever had! I'm glad you liked it. It's one of my very favorites. And I was happy to share.